Welcome home to 525 5th Ave N in the heart of City Park. This is the large, upscale condo you’ve been waiting to come on the market. There are many great features about this condo and I’m sure you’ll agree it is worth having a closer look. Located under the canopy of towering trees, mere steps to Kinsmen park and direct access to all amenities. This location is something special. No one wants to live in the hustle and bustle directly down town, so City Park is the absolute best option. This location also allows for plenty of off street and visitor parking. The balcony overlooks Kinsmen park and walking out the door leads directly to all the of Mewasin trail networks. This is a security controlled building and it has just undergone a recent facelift. The halls and interiors have just been painted and updated. Newer roof and boiler systems and a healthy reserve fund will make this a great long term property. It also comes complete with a rec room with a pool table and entertaining space for large functions. Inside the unit you will notice immediately how large, spacious and bright it is. A wall of south facing windows lets a plethora of natural light flood the space. It has a large dining area, large enough to accommodate all your family gatherings. The adjacent living room is huge. You will never feel cramped in this space. The kitchen has loads of cabinets and lots of counter space and all included appliances. There is also a breakfast nook and room to expand in this kitchen. The master bedroom has 2 windows, walk in closet and ensuite bathroom. Its a spacious retreat. An additional 2nd bedroom for guests, or it also makes for a great den, study or flex room. The main bathroom is larger than most and offers a full tub and shower. Another unique characteristic of this home is the amount of storage. There is lots of linen and storage closets but it also has a massive laundry room. This room is large enough that it could have many uses such as; craft room, hobby room, studio, office and even a small work shop. Its something you won’t find anywhere else. A large south facing deck allows for outside entertaining and relaxing while you sit and overlook the manicured and landscaped front yard and Kinsmen park. All window coverings, air conditioning, and central vac included. 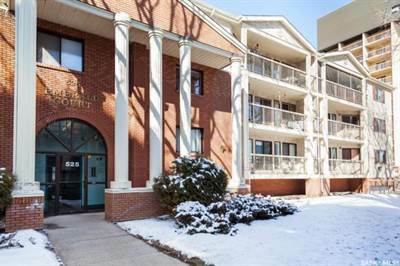 Last but not least is the amazing convenience of the secure, heated, underground parking. This is a massive treat and also comes with secure underground storage. If you are thinking about down sizing to a condo, I’ll tell you this unit is so spacious, offers so much storage, you won’t even know you’ve moved into a condo. Come and see for yourself.